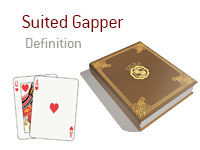 What is the definition of the term "suited gapper" in the game of poker? What does the term "suited gapper" mean? In poker, a "suited gapper" is when you are holding two cards of the same suit that are separated by one card. For instance - let's say that you are dealt As-3s in a game of No Limit Hold'em. This is a "suited gapper", as the hand is suited (Spades), and there is one card between the Ace and the Three. If you were holding As-2s, this would be called a "suited connector". "Suited gappers" can be valuable in a game with deep stacks, or in a hand that involves a large number of players. For instance - let's say that you are on the button. 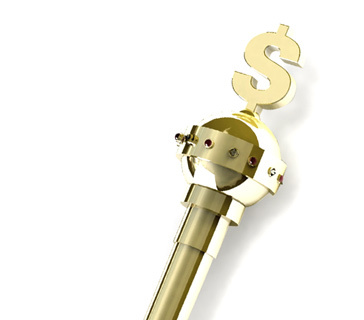 A player in early position raises, and there are four calls of the raise in front of you. You look down at 5d-7d and decide to call. Now, 5d-7d is not a strong holding in a heads-up scenario, but given the money that is already in the pot, and given the number of players already in the hand, you are mathematically compelled to call here. With a "suited gapper", you could make a straight or a flush, or even a straight flush. For instance, in the hand mentioned above, if the flop came 6d-8d-Ks, you would have a very strong draw and could potentially win a great deal of money.